Volcanic activity at mid-ocean ridges creates new seafloor crust that spreads outward to cover 70 percent of Earth's surface. We still do not understand this process completely though. What is the typical structure of the oceanic crust? How is magma supplied to the seafloor for eruptions? Several generations of scientists have dredged rock samples from the seafloor, used submarines and robots to study it, and even drilled into it to learn a considerable amount about the shallow oceanic crust. Seismic waves that penetrate and reflect off rock layers deep in the crust have been used to decipher the characteristics of the crust — similar to the way physicians use an MRI to peer below the skin. Ophiolites — isolated portions of the seafloor that tectonic forces have thrust up and exposed on continental margins have been heavily studied. 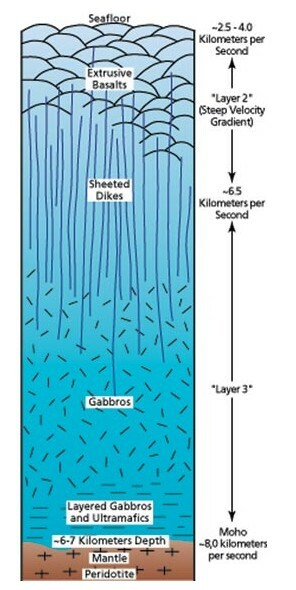 From early studies, a picture of the ocean crust emerged. It seemed the ocean crust was relatively homogenous in composition, structure, and thickness—sort of a geological three-layer cake about 6 to 7 kilometers thick. As shown in the cartoon above, the top layer was lava that spilled out and cooled rapidly into a glassy substance called basalt, which carpeted the ocean floor. Below the lava were great, vertical sheets of hot rock called dikes— the pathways by which magma was injected to the surface from deeper layers, now cooled and solid. Finally, lying atop the mantle itself, was a lower layer composed of magma that rose directly from the mantle, cooled more slowly, and froze into a rock known as gabbro. Ophiolites offer the convenience of being able to walk on an outcrop and directly study geological relationships between the different rock units of the crust. The photograph below shows a cliff in Oman Ophiolite composed of a section of vertical dikes. The rock hammer is shown for scale. Although hard to get to, such cross sections through the crust can also be found on the seafloor. One of those places is Hess Deep, where a giant tear in the crust exposes the interior of the oceanic crust. The bathymetry of the region of the equatorial Pacific Ocean near Hess Deep Rift is shown below. The hot colors are shallow seafloor and the cool colors are deep seafloor. 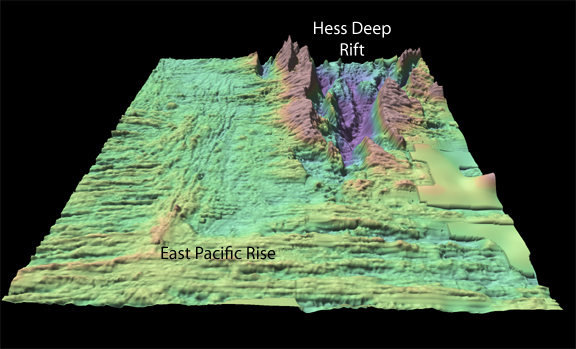 The dominant Hess Deep Rift is cutting into the oceanic crust formed at the East Pacific Rise spreading center. Similar to the cliffs in Oman the large cliffs bounding the Hess Deep Rift expose sections of the ocean crust. There have been several research cruises at the Hess Deep Rift to study the ocean crust. 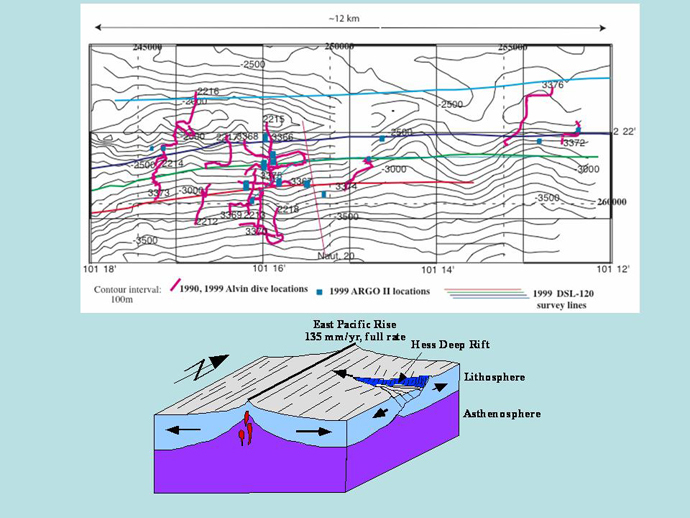 The top panel in the figure below shows a contour map of one of the cliffs and the locations of survey lines using deeply towed instruments and sites of submersible dives on the cliff. The bottom panel is a cartoon showing the relationship of Hess Deep Rift and the East Pacific Rise spreading center. 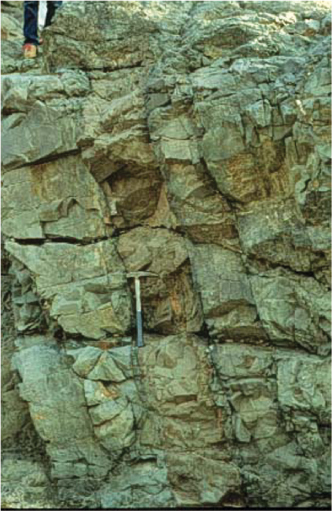 Mapping of the cliffs using deeply tow instruments and submersibles have revealed vertical dikes similar to those shown above in the picture from Oman Ophiolite. 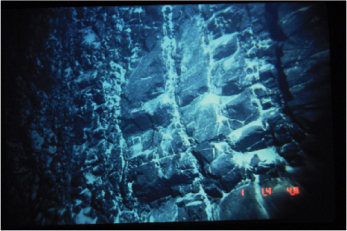 The photograph below was taken by a deep-sea camera and reveals the vertical dikes that fed eruptions on the deep seafloor (~3000 m) when it was formed at the East Pacific Rise. The chemistry of the rock samples collected from seafloor dikes is allowing scientists to understand how magma rises from the mantle into the crust and solidifies to form the gabbros. Rock chemistry is also providing information for understanding how magma travels to the surface through dikes to erupt lavas and build the seafloor topography. The creation and cooling of oceanic crust is the primary means by which heat escapes from Earth’s interior. In this dynamic planet-scale process, heat, chemicals, and minerals are transported from Earth’s interior to its surface. Over the long haul, the process ultimately determines Earth’s chemical makeup.